before, during, and after the storm. With only 45 days until the start of the 2019 season, what can you expect? 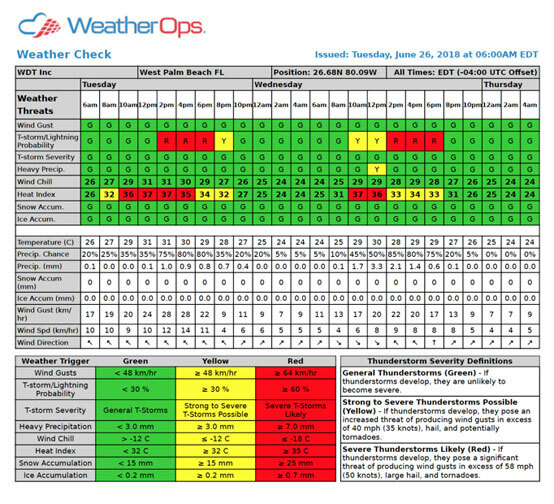 Plan ahead for high impact days and/or adverse weather threats using customizable thresholds. Set the standard for outage response in your area. Plan ahead for heavy load days and/or adverse weather impacts with this report that outlines the following 48 hours in 2 hour increments. Mobilize crews ahead of severe weather impacts with a highly visual U.S. overview of forecast wind, hail, storm or heavy precipitation for the next 7-days. Ice, wind, and wind chill forecasts are outlined for the next 7-days, helping utilities prepare for service interruption and in planning mutual aid resources. WeatherOps provides track and intensity forecasts for tropical features that we consider likely to develop into cyclones. This report guarantees you know first. Our forecast team monitors your specific servicee area. If we determine a threat is possible, a WeatherOps forecaster issues an actionable alert. Providing linemen real-time lightning proximity alerting while in the field, including “all-clear” notifications for point and areal locations. 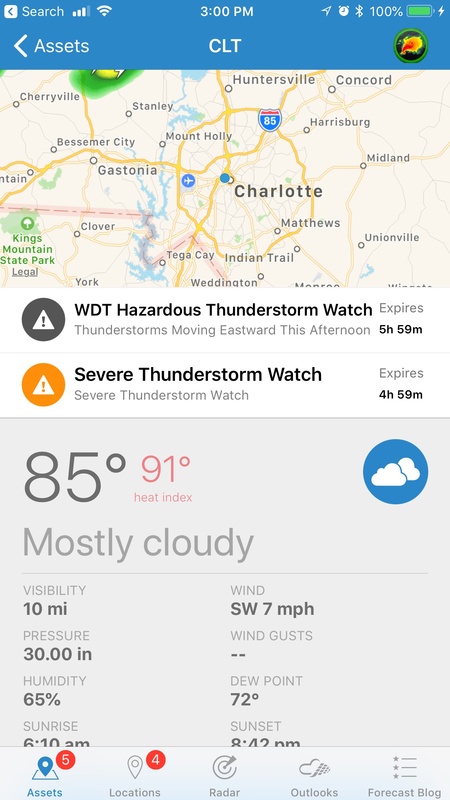 WeatherOps automatically filters and sends National Weather Service Watches, Warnings, and Advisories specific to an asset, all in just seconds. Put our companion app in the hands of employees and contractors who are exposed to weather risks. Available on the App Store & Google Play. For quick identification of days/times that weather threats may be present, customize parameter thresholds based on your specific operating conditions. At a glance, see only the weather risks that matter to you, covering all of your assets using a color-coded threat matrix. Available in 2, 6, 12, and 24 hr increments. Enter a location, date and time period, and receive a map and list of lightning strikes that occurred. Proving the presence of lightning is now possible! 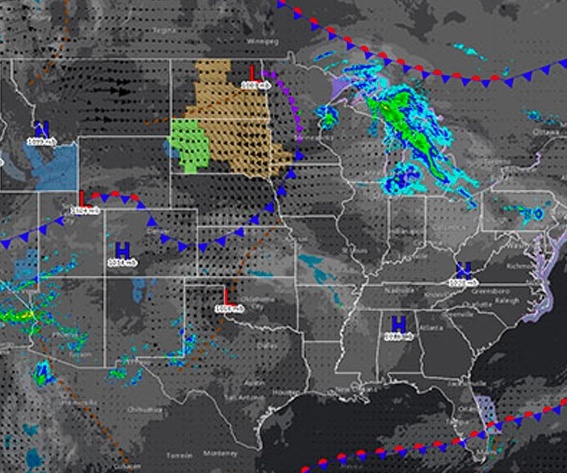 This long-range forecast packed with graphics and data highlights days 2-5, 6-10, and 11-15 allowing you to plan ahead of anomalous temperatures. 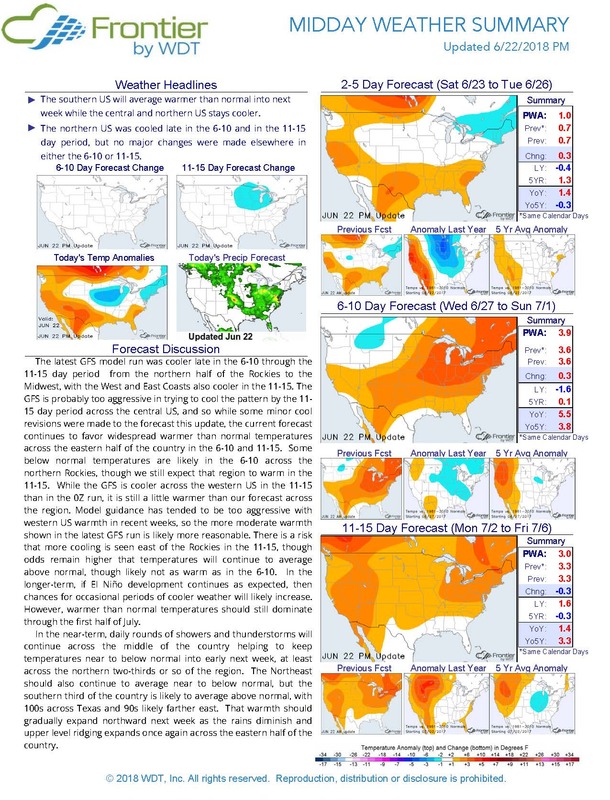 Like the 1-15 Day forecast, this summary highlights expected temperature and precipitation anomalies, as well as HDD and CDD totals over a longer period. Days 31-60 temperature anomalies, HDD & CDD data predictions as well as hydro/drought outlooks essential to commodities industries & traders. 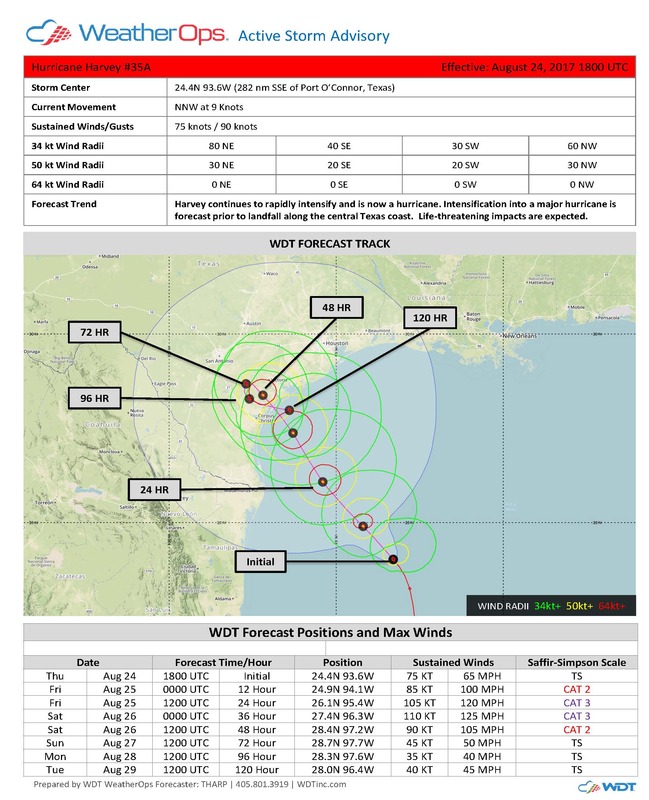 An assessment of tropical cyclone impacts and specific timing of forecasted winds for asset locations according to your custom response plan. 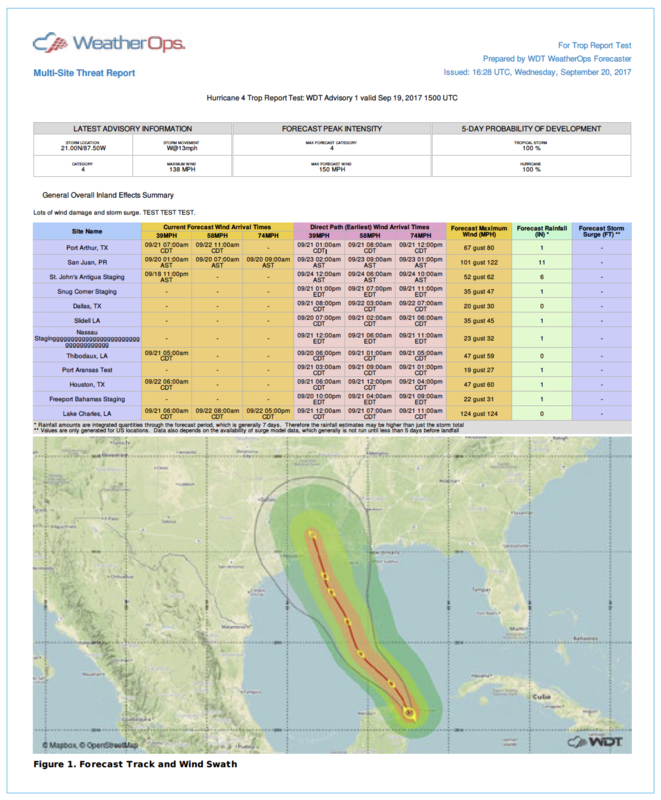 A simple yet detailed threat report that offers a direct assessment of potential tropical cyclone impacts on a grid or asset across a service territory. Twice per week long-range forecast for interests bordering the atlantic basin who are susceptible to tropical cyclone impact. 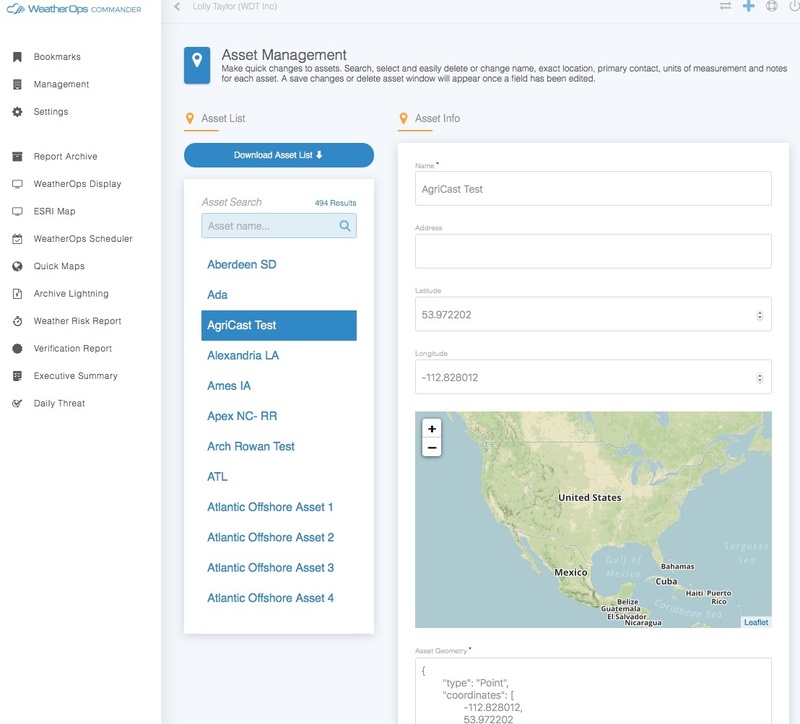 Manage users and assets, customize forecasts and asset-based alerts, set product and alert distribution, view maps and report archives. Powered by the most accurate weather data available. 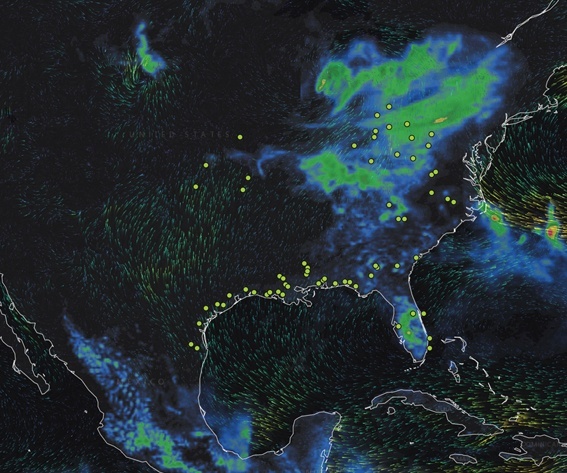 WeatherOps GIS helps you tell your story through interactive mapping technology by providing the largest selection of weather layers on the market today. 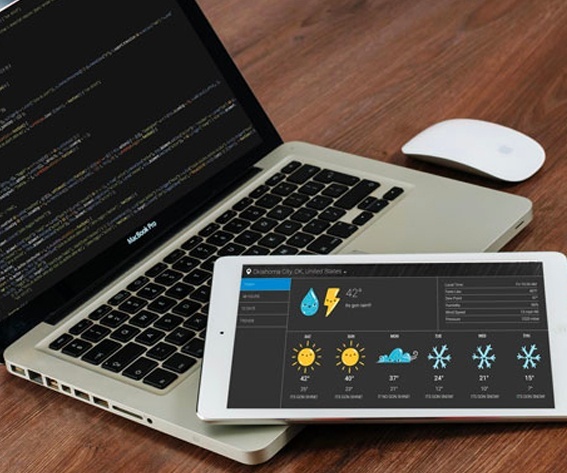 WeatherOps maintains the richest set of global present and historical weather data analytics on the market today. Gain access to our precision-verified 10-day forecasts with daily and hourly data as well as current observations for any location on the planet. Weather layers in your own mapping environment with this infinitely flexible, tiling architecture. Renny Vandewege serves as Senior Vice President of Business Development at WDT, overseeing the overall growth of WDT’s customer base and markets globally. 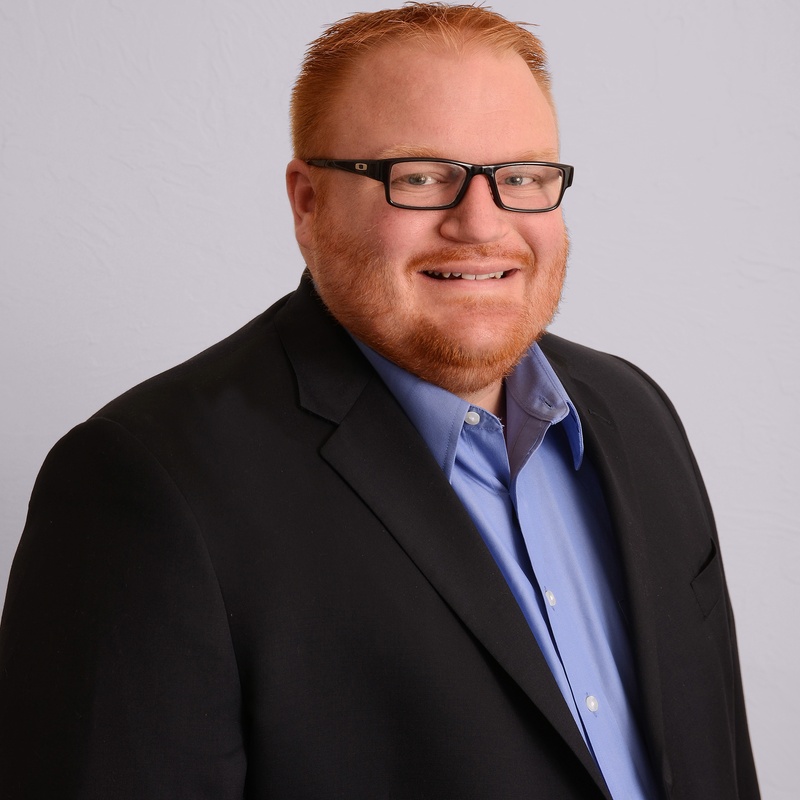 He has been a leader in the weather industry for over 13 years, with a focus on growth of revenue and programs in broadcasting, academia, and the private weather industry. Chris Kerr joined WDT in May 2012 as a founding member of WeatherOps and as Lead Forecaster. Since that time he has become Director of WeatherOps Forecast Services and has helped grow WeatherOps into a top notch global leader in forecaster services and decision support. Chris has over ten years of operational forecasting, asset protection, decision support and managerial experience. He is highly involved in the planning and implementation of techniques and processes that allow WeatherOps to produce high-resolution global forecasts and fully customizable alerting. Chris has extensive experience in the marine weather sector and is well-versed in cross-ocean and fixed position site forecasting, tropical cyclone forecasting/climatology and worldwide ocean basin climatology. 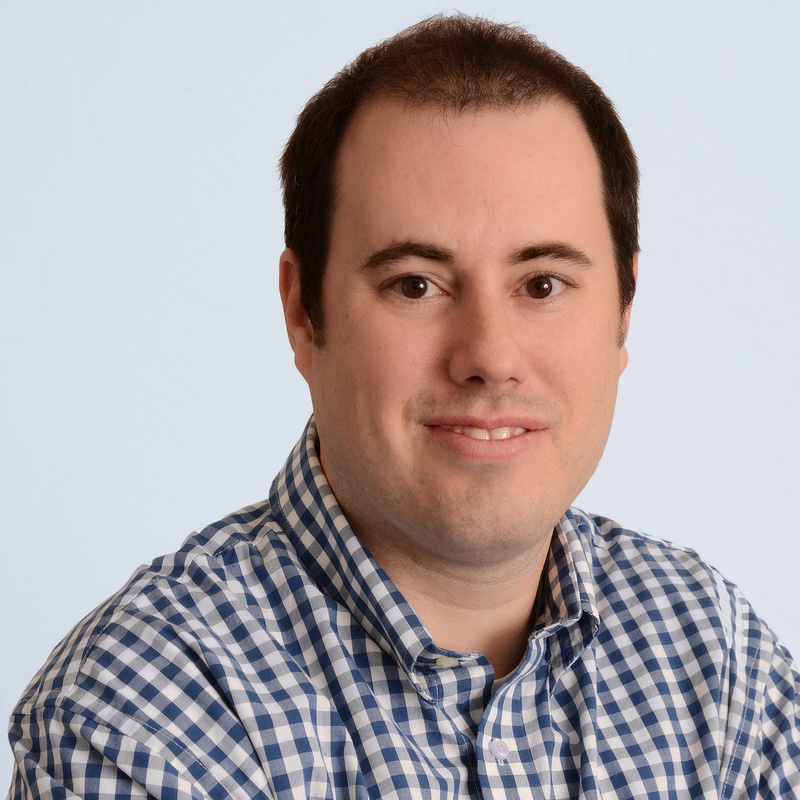 John Tharp joined Weather Decision Technologies in June 2014. Before joining the team at WDT John, a Penn State graduate, spent nearly five years as a meteorologist with a competing organization in Houston, TX. In that role he developed significant marine and tropical weather forecasting skills. John has a profound understanding of the alerting and forecasting needs of marine and land-based energy interests around the globe. 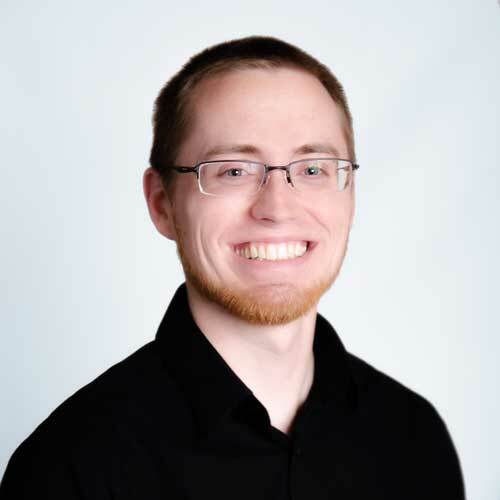 His excellent grasp of synoptic meteorology, coupled with his insights into the needs of WDT’s growing client base, allows him to lead many efforts to improve our forecast and alerting products and procedures. This site-specific weather forecast is delivered once daily and consists of a detailed 7-day outlook presented in time increments of 6 hours and include the following parameters (Customizable thresholds available for all BOLD parameters). Our 48-hour Weather Check, issued daily, includes a detailed forecast presented in two-hourly time steps that include the following parameters (Customizable thresholds available for BOLD parameters). This Planner combines a 7-day projection of thunderstorm and heavy rainfall threats to assist decision-makers with planning for impacts. Thunderstorm forecasts include wind, hail and tornadoes. WeatherOps forecasters rank the potential impact of these threats on an easily understandable scale. The threat of excessive rainfall is assessed similarly. Thunderstorm outlooks are generated using proprietary algorithms developed by members of the WeatherOps weather research and forecast teams. In addition to the 7-day national forecast, when your area is under threat during the upcoming 72 hours, we’ll send you a high-resolution regional map and an easily understandable written discussion regarding expected threats. 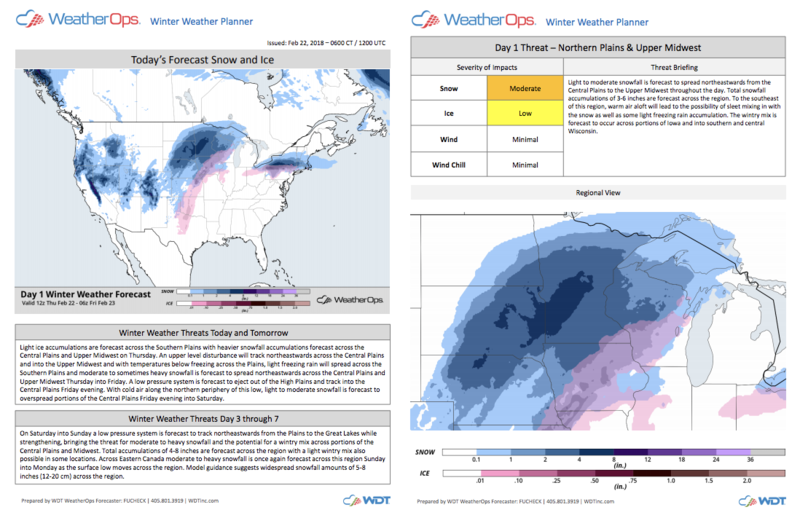 Winter Weather Planners contain snow and ice forecast graphics, surface charts, and detailed summaries of upcoming significant winter weather events. WeatherOps forecasters assess the regional impacts of snow, ice, wind, and wind chill on a scale from Minimal to High. Significant events are based on WeatherOps winter weather criteria, which take into consideration local climatology and elevation. WeatherOps provides track and intensity forecasts for tropical features that we consider likely to develop into cyclones. We do so well in advance of official National Hurricane Center (NHC) or Joint Typhoon Warning Center (JTWC) Advisories. Our Significant Tropical Disturbance Advisories provide a full track and intensity forecast for any tropical feature of interest. For many of our customers, waiting for the NHC or JTWC to begin official track forecasts can be far too late to take critical preparedness actions. In 2017, our initial tropical storm forecasts originated, on average, 50 hours before the NHC began forecasting them. Once our forecasters determine that a tropical feature in any Tropical Basin in the world has a threat of development during the next five days, we designate it as a Significant Tropical Disturbance, and we will begin issuing twice daily Significant Tropical Disturbance Advisories. Once determined that the disturbance poses a threat to develop, we increase our Advisories to four times per day. 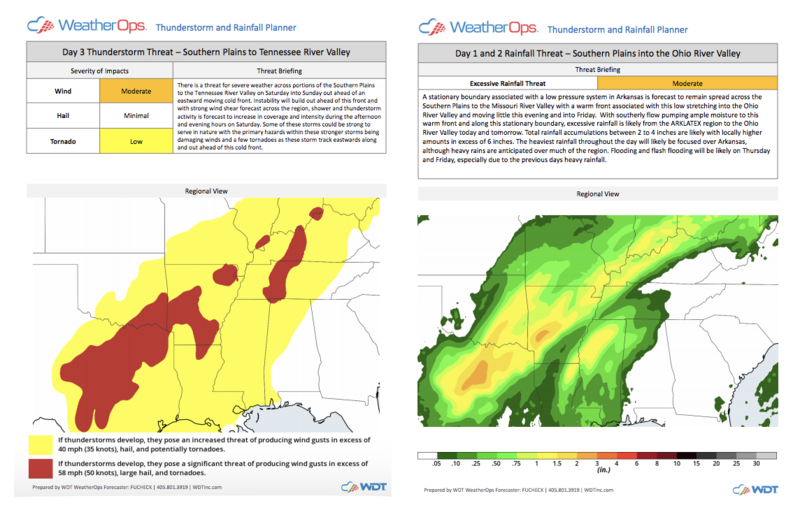 The WeatherOps team issues short-fuse, event-driven alerts and outlooks covering Tropical Weather, Winter Weather, Severe Storms and Excessive Rainfall as soon as they are forecasted or predicted to be a threat to your business. 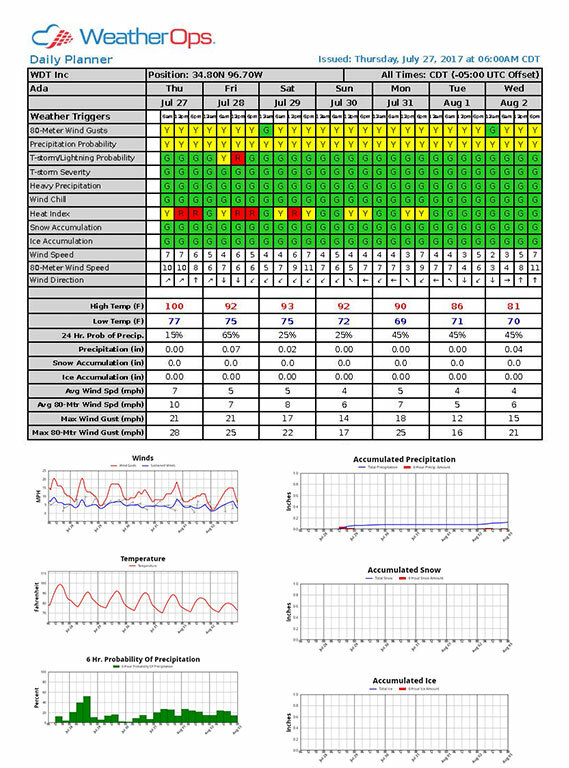 Alerts are color-coded to communicate severity quickly and easily. WDT’s patented alerting technologies disseminate these alerts in real-time via HTML email and SMS. 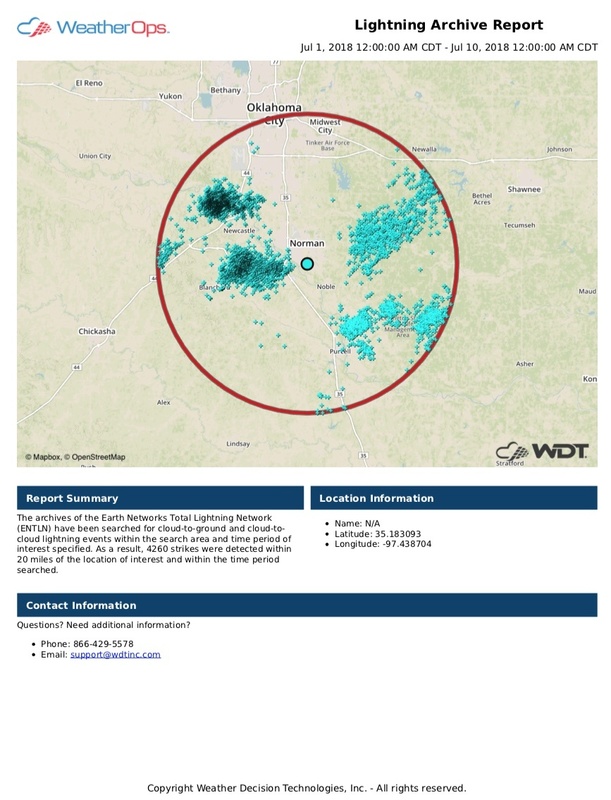 WDT’s automated systems and data streams provide real-time lightning proximity alerting including "all-clear" notifications for those locations where operations are sensitive to lightning risk. 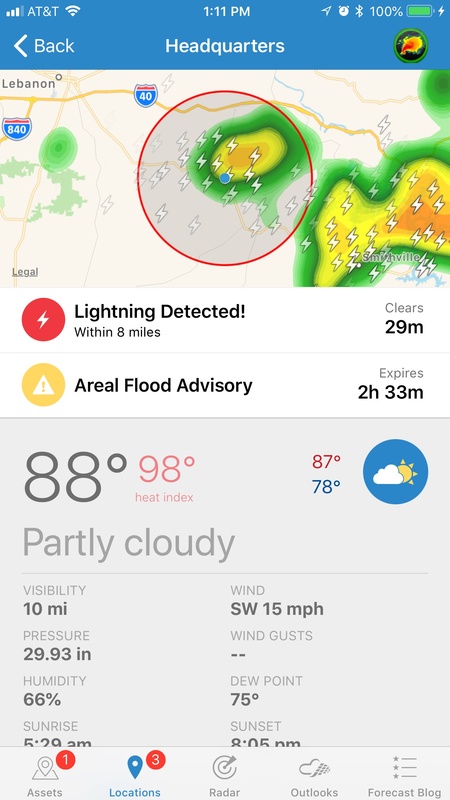 This system detects and distributes lightning alerts via email, SMS text, and push notification through the WeatherOps mobile app; in the WeatherOps Display (audible and visual). WDT utilizes the global Earth Networks Total Lightning Network (ENTLN) for all of our lightning services. Only receive an alert when one of your asset locations is within the polygon. 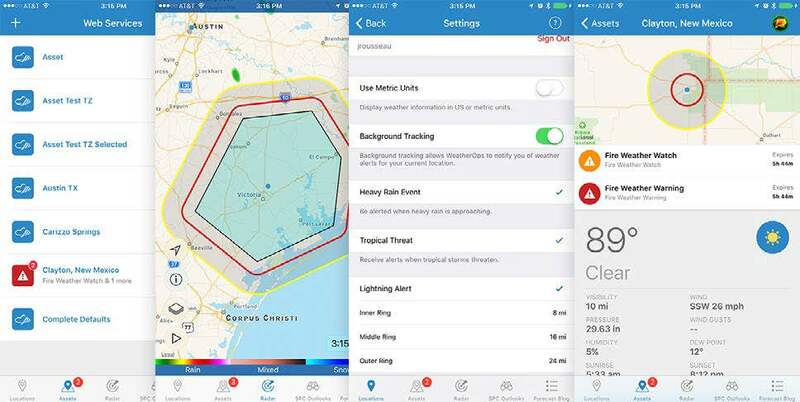 WeatherOps automatically filters and sends National Weather Service Watch/Warnings & Advisories, specific to your asset, all in mere seconds. We deliver standard National Weather Service watches, warnings, and advisories for weather events such as tornado, winter storm, flood, wind, tropical and fire via email, the WeatherOps Display, and the WeatherOps mobile app. Customization of the parameter thresholds based on your specific operating conditions provides a quick glance at the forecast to reveal when parameters have exceeded a threshold. We’ve taken our threat matrix and compressed it so you can see all of your assets in one place simultaneously. 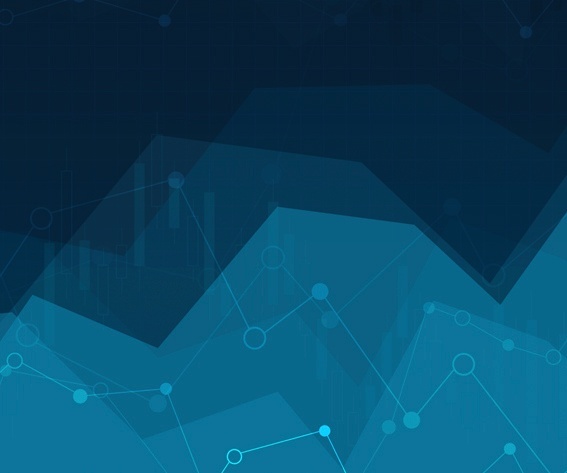 At a glance, you can quickly identify assets that may require focus in the following days. The temporal resolution in this report is customizable just like the Dynamic Planners. We help you by providing a Management by Exception solution. In this report, decision makers see only assets with a parameter “triggered” during the following ten days. Simply set your thresholds and only see which asset(s) will exceed these thresholds. Our lightning reporting tool offers a way for you to confirm weather conditions after a storm occurred to submit with a claim or organize operational repair crews. Input a location of interest, as well as the date and time period, and we’ll generate your report to visually show where lightning strikes occurred in a set radius of your location. Also included is a table providing lightning strike date/time, lat/lon, amps, exact distance from location and bearing. Our forecast is issued each weekday morning around 6:45 AM CT and highlights the 2-5, 6-10, and 11-15 day temperature anomaly and precipitation forecasts. 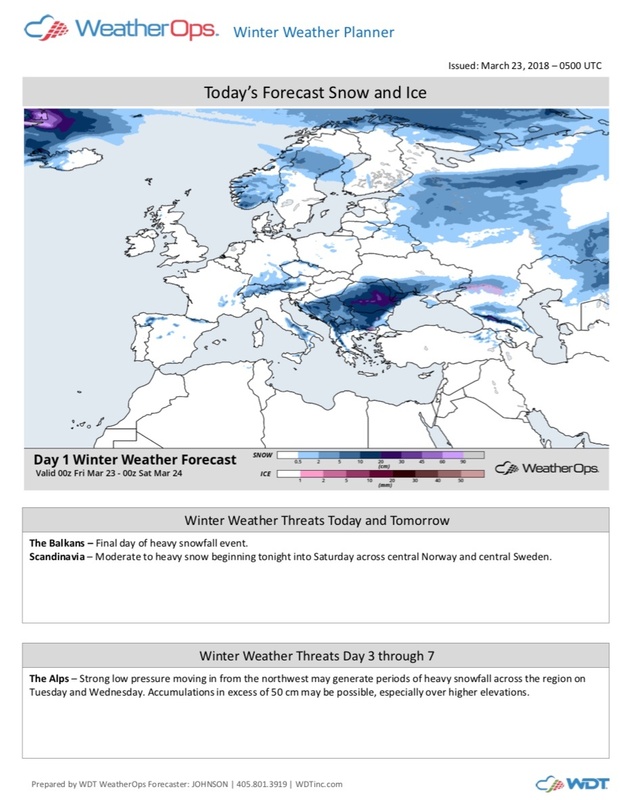 Included in each report is a discussion of current and forecast weather trends along with additional informative forecast graphics and data, as well as forecast graphics for various international regions. Forecast accuracy is crucial, and we keep track! 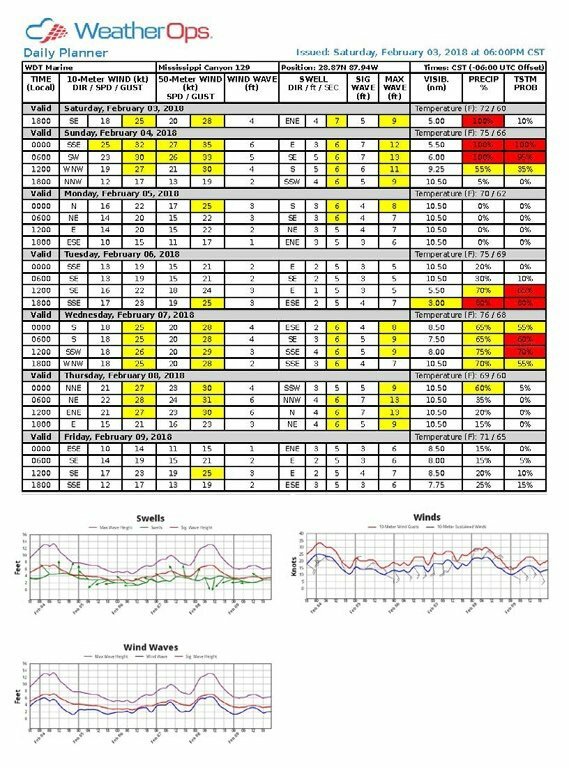 View our forecast verification stats. 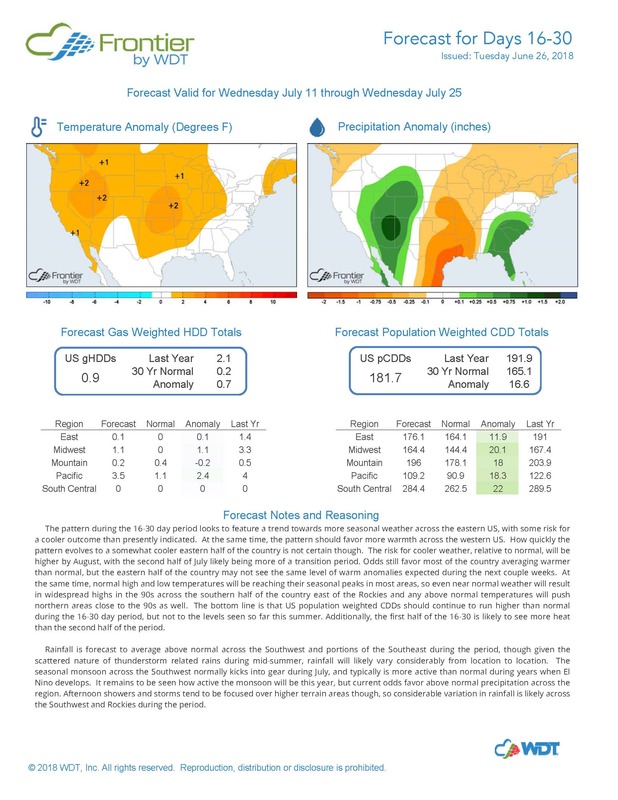 This forecast issues each Tuesday and highlights expected temperature and precipitation anomalies, HDD and CDD totals, with a detailed support discussion. Instead of site-specific forecasts, these rely on probability. Forecasts also outline events such as El Niño and La Niña and the projected sea surface temperatures associated with them. 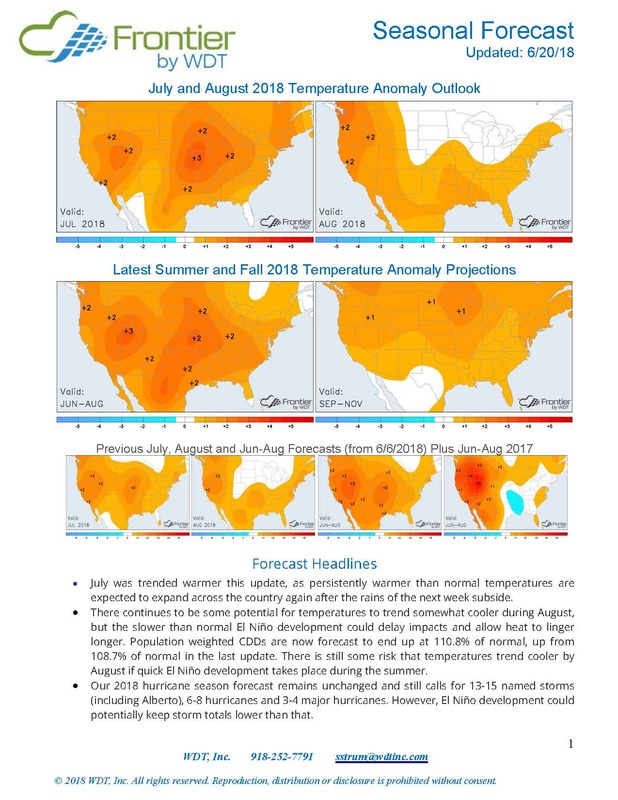 Our seasonal forecast is a look ahead at the next several months with discussion and imagery supporting our thoughts regarding temperature anomalies, HDD & CDD predictions, and hydro/drought outlooks. 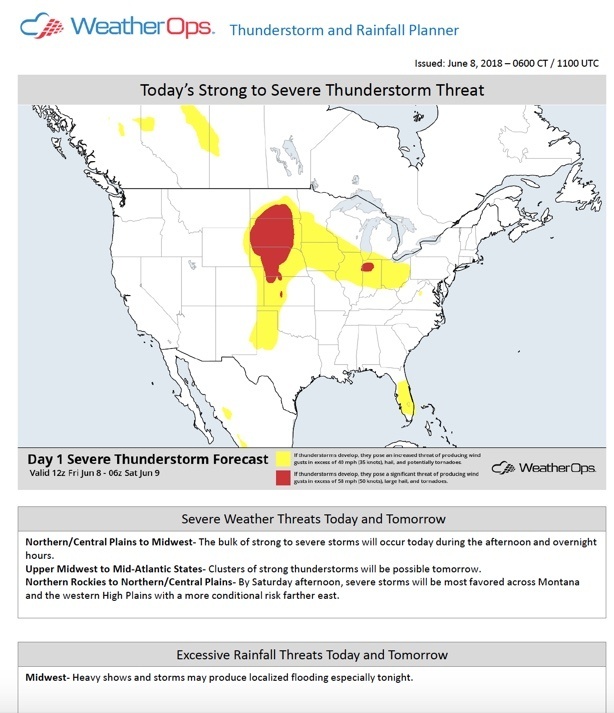 This report issues twice monthly on Wednesday evenings around 6 pm CT.
We connect weather threats to your action plans for both onshore and offshore assets. 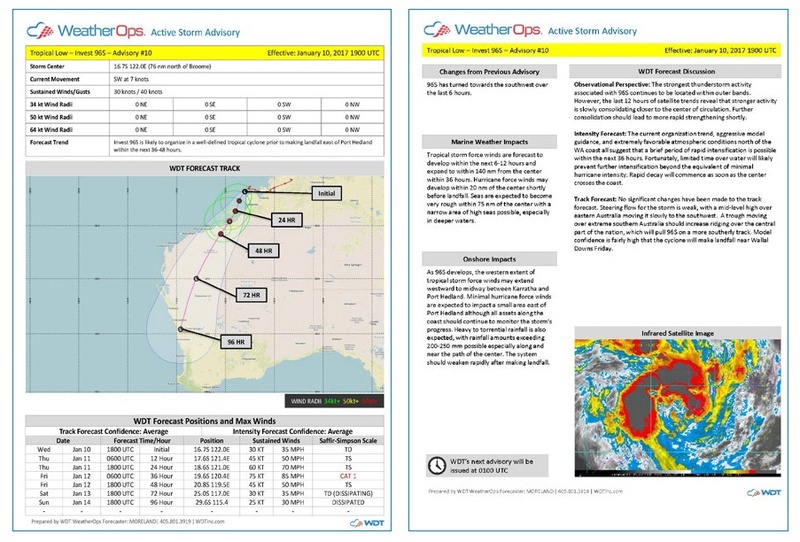 These reports are designed to provide a direct assessment of the potential impacts of a tropical cyclone to our customers’ assets with specific timing of forecasted winds for each location. T-Time reports focus on the offshore marine assets while Risk & Response reports serve a variety of land-based customers. These initiate for areas threatened by a tropical cyclone as soon as WeatherOps begins issuing significant Tropical Disturbance Advisories. To provide detailed planning information to our customers, we produce Threat Reports. These reports are designed to give a direct assessment of the potential impacts of a tropical cyclone/Typhoon to our customers’ assets. These initiate for areas threatened by a tropical cyclone as soon as WeatherOps begins issuing Significant Tropical Disturbance Advisories. Lists storm position, intensity (Saffir-Simpson scale), forward speed, hourly wind speeds listed for a given single location or multi-site lists for all of the assets impacted within the company. Forecast guidance table listing expected wind arrival times (39 mph, 58 mph, 74 mph), along with forecasted maximum wind at the site and anticipated rainfall. "Worst Case" scenario direct path guidance table which assumes the tropical system will move directly toward the asset. 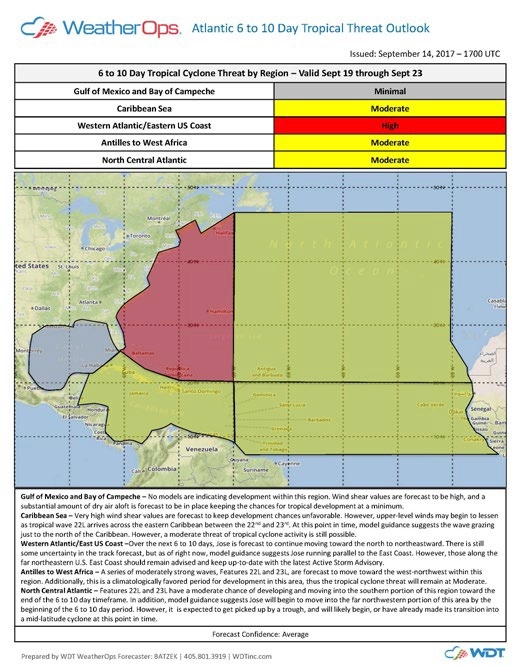 Issued twice per day (based on the 09 UTC and 21 UTC advisories) for potentially affected assets once Significant Tropical Disturbance Advisories or Active Storm advisories begin. On Mondays and Thursdays during the Atlantic tropical season, WeatherOps issues a longer-range threat outlook for the Atlantic Basin. This update covers the 6-10 day period with predictions for tropical cyclone development potential for sub-regions of the Atlantic basin, plus a detailed write-up describing these threats. WeatherOps supports you with our 24-hour help-desk for all technical issues or questions via phone or email. In addition, every new client will be professionally trained by a dedicated Customer Success Manager / Meteorologist. 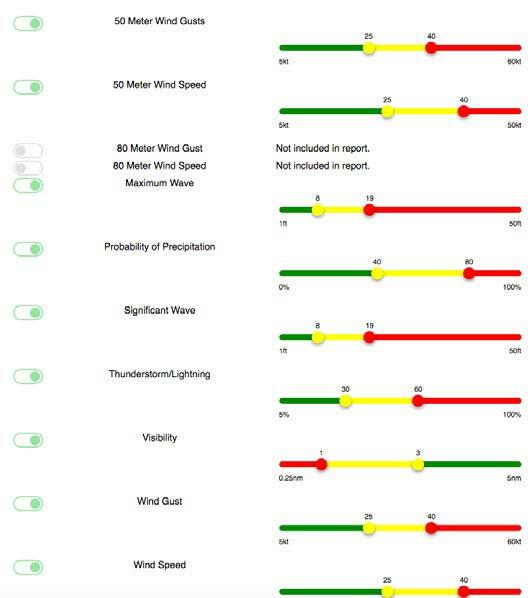 The marine site-specific weather forecasts consist of a detailed 7-day Marine Daily Planner (presented in six-hourly time steps) including the following parameters (BOLD have customizable thresholds for color coding). Marine Weather Checks are similar forecasts but for a 48-hour period broken down into 2-hour increments. 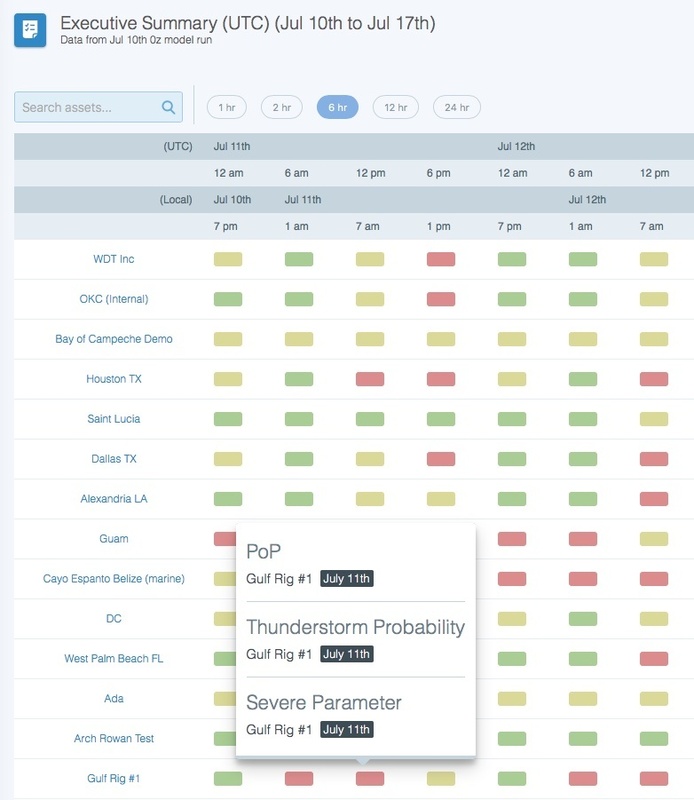 Assess the risk for lightning and prove or disprove the presence of strikes at any location by accessing our world-class database of strike information for a specified location and date or span of dates. This popular report offers a complete climatological profile and includes a detailed history of observed rain, wind, lightning, and temperature information as well as a long-range forecast for any location and date range. Our Weather Impact Report is the fastest way to prove or disprove the presence of specific types of weather or conditions after weather occurrence. These reports are a perfect supplement for insurance claims and legal matters.